I don’t usually write about computer clutter in my blog as it is not really an area of expertise for me. However I am going to mention it today because it can be a problem for some. I would like to concentrate on email clutter. I am not actually talking from a personal level here more from a professional point of view. It can be very annoying when you share a computer, specifically email, in he work place with people who are not very computer savvy. The idea of using folders to sort emails is alien to some and even deleting unnecessary emails does not seem to be a priority. Therefore the inbox is forever full. As for my own personal email I probably receive too many decluttering and lifestyle blog updates but they often inspire my posts so even though they use up time they also save time otherwise wasted pondering over what I am going to write about. I try to make sure I empty my inbox everyday which mostly involves reading and deleting but sometimes I move emails to folders for future reference. I clean these folders out on a regular basis too. Most of the time I spend on my computer is used writing my blog and responding to the comments and emails that it generates but I consider this my volunteer time. What I do is helping others so I feel justified in that. As for desktop, my document and other files, I am a lover of folders there also. I can usually find exactly what I am looking for because I create folders with major categories, and inside them I create subfolders to break down those categories. That keeps thing neat, tidy and findable. 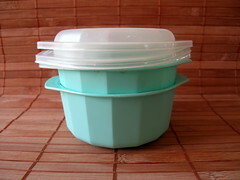 These microwave bowls are now in the donation pile which I think will be heading to the thrift shop this week sometime. Gmail sounds like a good system especially for a place like where I work. I however am not in the business of storing anything unless it is completely necessary. Clinging on to stuff even email is not what I am about. My intension with this post wasn’t to inform people of what is the best email system to use but just to remind them to declutter and organise so they don’t have a whole bunch of useless email clutter clogging up their inbox. I appreciate your information though and hope you will chime in with more helpful ideas in the future. Like I always say we are all here to learn from each other so the more input the better. actually I blame you for all my extra blog reading because you have so many great links on your web site that I can’t help myself and have to check out a couple every time I go over there. Then I subscribe so I can check them out properly over a couple of posts. I do behave myself and unsubscribe if I decide I am not that enamored after all. I’m very bad about clearing out my inbox. Good reminder, thanks! At work, I keep my “to-do” list in my inbox – but manage to keep that rather short. For personal email, I use a wonderful tool that is available in most email software – rules! I get lots of emails on different topics – crafts, sales flyers, financial information, etc. I set up rules for each one of the different areas and have my software program (in this case, Thunderbird) automatically send those emails into a separate folder. Keeps my inbox nearly empty. Also, I know that the financial folder needs to be looked at ASAP, but crafts, recipes, etc can be put off until I have some free time. Helps me make better use of my time too so I don’t get distracted (too much). That sound like a good set up to me. You want to be organized so you run a good system and you know how to use it. I find it doesn’t matter what system you use, what matteres is just how organised you are personally. As the old saying goes a poor tradesman always blames his tools but his poor workmanship is usually down to his lack of expertise or laziness. Meaning you can run a great software but if you don’t understand the basics of organizing yourself it isn’t going to make a scrap of difference. electronic clutter is a neverending story: I managed to stay on top of my desktop and my folders (never more than 3 sublevels are one big rule for me) unfortunatly during my decluttering of those folders with pics, I somehow lost my holiday pictures from greece… but thats a different story. now I just decided after reading this post, my freemail could use some declutter. again not so much the folders, but basically every adress of it is out of date and useless… I just changed that. the comments here are priceless: guess what: I remembered I already have a gmail adress. I figured I could activate it again and now I will try that. labels are a smart way to organize… and because I have basically endless storage, I can save important mails until the day I die. thanks for that post. I love reading through your archives, so many aspects that I would never have thought of. I have to admit I don’t worry too much about digital clutter because like you I have endless storage and it isn’t affecting the environment. I have also been quite organised in my digital filing system so I know where to find things and constantly declutter items that are no longer of importance. I am the same with my email account. One of those organising skills I take for granted I suppose. Digital clutter is like physical clutter for many, they spend far too much time accumulating it and no where near enough time maintaining, organising and decluttering it.